What a genius I am, I thought to myself. I am smart. I have come up with a solution to a large segment of the illegal alien problem. Many of the illegal’s are coming across the U.S.-Mexico border. We try like hell to keep them out, but they keep on coming. It is not easy trying to secure a border that is 1969 miles long. Build a fence, is what some people say. Others want to transfer our troops from Iraq and Afghanistan to protect this border. In other words, let us build the U.S. version of the Iron Curtain. We could build guard towers every three hundred feet and staff them with border patrol people who will shoot to kill. Clear a swath several hundred yards wide along the border to give the sentries a clear shot. Even better yet, mine the field so the poor bastards coming across are blown up. Drastic measures have to be taken or the illegal’s will destroy our economy before Obama and his pirates can do it. The solution is so simple, but not one that is easy to swallow for either side. I began to do some research to find facts to support my premise. It occurred to me that I should Google the idea to see what is already available on the subject. Surprise, surprise, I got 43,600,000 hits on the idea. I guess it was not such an original idea after all. Or, maybe I should say my idea has a lot of merit since so many others have had the same thought. The reason the illegal’s are such a problem, is that we have legislated too many ways for them to get all the neat free stuff we give to our own citizens. Health Care, Education, Food Stamps, Social Security, and driver’s licenses, are available to these people and they do not pay a cent for it. Well, let us change that by making them pay. How? 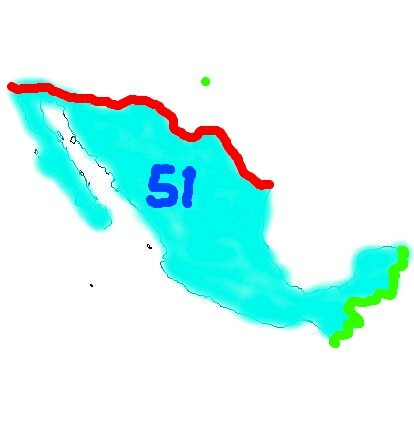 Annex Mexico as the fifty-first state. Instantly they become citizens who are obligated to follow our laws, and to pay taxes. Since they have to get minimum wage like the northerners do, there is no advantage to hiring them in the upper fifty. That means the jobs they have now will have to be taken by the poor northern boys who are out of work. Maybe some of the Acorn people would like to do something productive for a change. Another advantage is that this move will stop the flow of manufacturing jobs to the south. Why? The economic advantage is lost. The jobs will have to go to some other third world nation. The liberal progressives and Obama will like that. Spread the wealth baby. The Federal Government could eliminate the US Border Patrol because there would be no need to check for jumpers any more. Think of those tax rebates we would get from that move. The Border Patrol people will transfer to the IRS. No doubt, we would need extra people to collect all those new tax payments. I could go on and on with lots of great reasons to annex Mexico, but with forty-three million hits on Google there are too many words occupying cyberspace on the subject already.